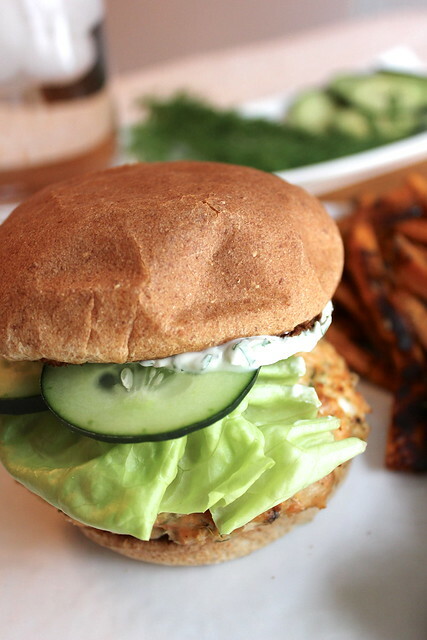 These salmon burgers were a fun switch from regular hamburgers or a simple salmon fillet. 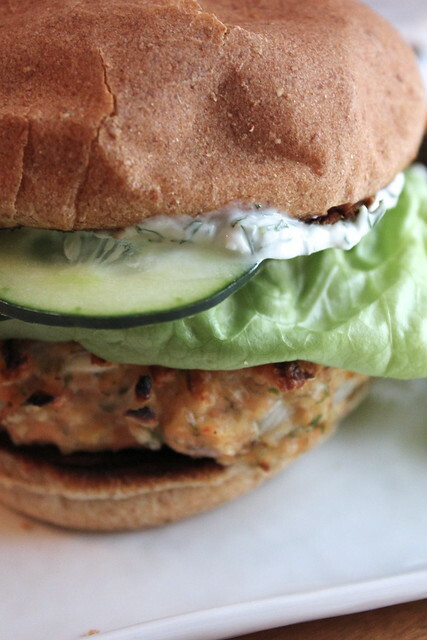 Fresh salmon is combined with fresh dill, horseradish, lemon zest, and shallot to form a super tasty burger. Then it is topped with a light sauce made from fat free Greek yogurt, fresh dill and a touch of honey. These are so simple to make, you basically throw everything into the food processor and then the oven. I would try to get salmon without the skin. I didn’t do this and removing the skin was the most time consuming part of the meal prep. Most ovens come with broiler pans but I think they are pretty underused. I know I rarely use mine! I dusted it off for this recipe and it was perfect. If you don’t have a broiler pan you could use a cooling rack placed over a baking sheet. These were perfect with slices of crunchy cucumber and crisp lettuce. 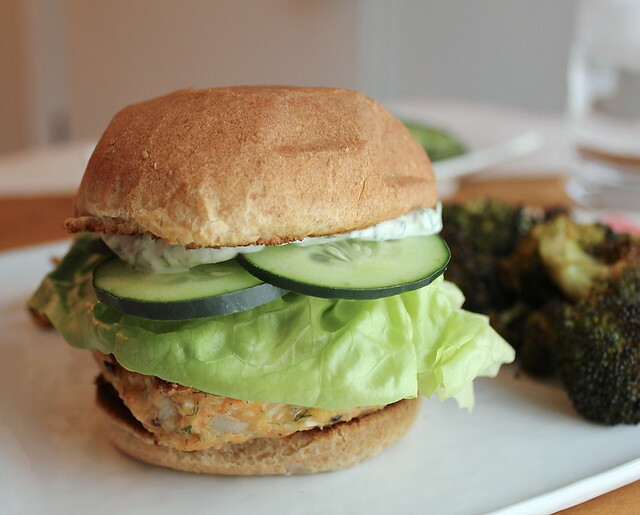 I served mine with oven-roasted broccoli and sweet potato fries. It was a delicious and healthy meal. Preheat the broiler. In the bowl of a food processor combine the salmon, shallot, zest, horseradish, 3 Tb chopped dill, salt and pepper. Pulse until combined and the salmon resembles ground meat. Add in the egg and breadcrumbs. Pulse until combined, scraping down the sides of the bowl. Form the mixture into four or five patties. Place the burgers on a broiler pan and broil for 5 - 10 minutes, until the tops are slightly browned and they are cooked through. To make the sauce combine the yogurt, 1/4 cup chopped dill, honey, lemon juice, and salt and pepper to taste. Stir to combine. 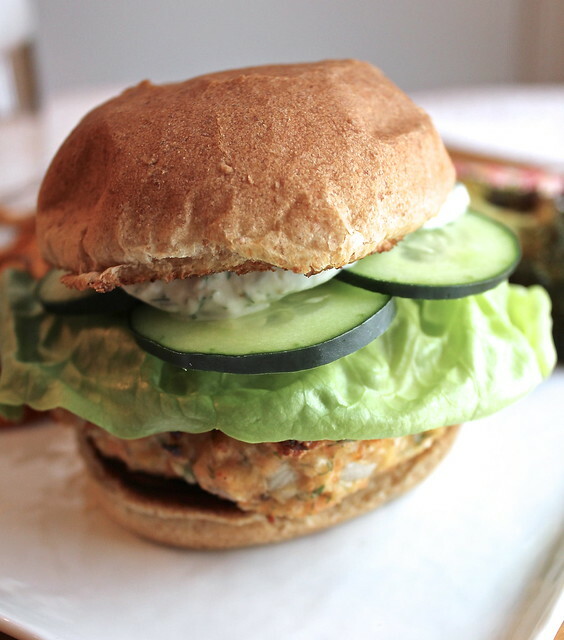 Serve burgers on buns with sliced cucumber, lettuce, and plenty of dill sauce.